There is always something exciting going on at The Vine on Main! Whether it is a “Finally Friday! Block Party” event, a new fair trade partner or local artist, a seasonal beer, or a unique wine, we have something new for you to discover and enjoy. We are open seven days a week. We work with several Fair Trade Federations who travel the world, build relationships with the countries and their artisans, who import and distribute these beautiful pieces. In this way, we are able to offer a wide variety of diverse items from many, many countries while still being able to price them reasonably for you. From babies to adults, functional or fantastical, practical or decorative, we try to make selections that will delight anyone walking into our store. Our customers have said “If you walk around this shop 10 times, you’ll see something different each time!” In fact, one customer recently shared that she walks around slowly one way and then reverses her direction just to be sure she doesn’t miss anything. We love that! Whether you like the concept of supporting a local artist or whether you get your inspiration from them, our goal is to also offer a venue for artists that have a small inventory but big talent. Come see astounding origami, fun and functional blacksmithing, miniature literature lockets and more. If you like their work, chances are good that you will have the opportunity to meet the artist and/or get a custom one-of-a-kind piece for yourself or as a gift. 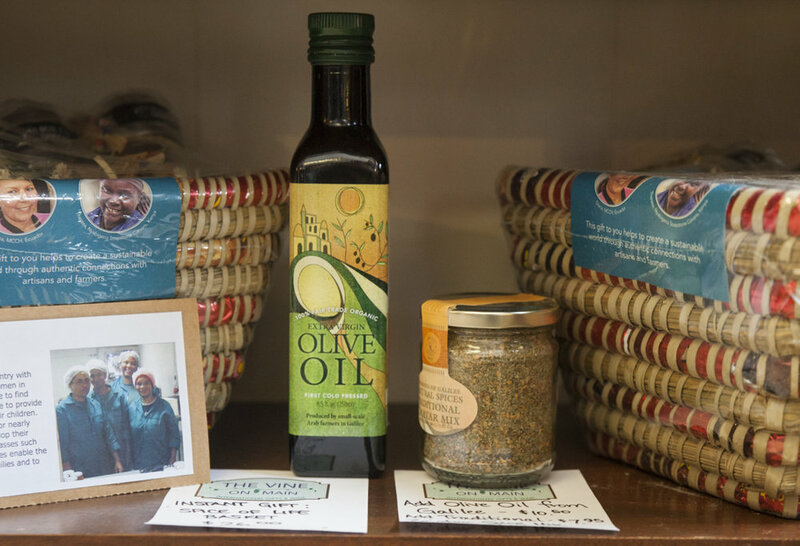 We recently expanded our inventory to include high-quality, fair trade, food items from around the globe. Spice blends from Madagascar & Zanzibar, Hot Drops from Africa, Olive Oil & Za’atar Mix from Galilee are perfect for the cooks in your life. Buying Organic fruits, nuts cocoa and coffee from small farmers makes a big change in their lives. Whether you like your coffee mild (Body, Mind, Soul) or bold (Love Buzz) there is a perfect blend for everyone. And oh, the chocolate! Divine Chocolate is made from cocoa beans harvested in Ghana but the beautiful chocolate bars ranging from White Chocolate with Strawberries to 85% Dark chocolate are made in Germany – the best of both worlds! The hot chocolate is traditionally milk or especially dark – a treat for chocolate lovers. The organic tea is hand-picked and we have a wide selection ranging from Darjeeling to Earl Grey and from Green Tea to Masala Chai. Do you need a special gift? We specialize in creating unique gift baskets to both perfectly suit the personality of the recipient and we work within a budget you decide upon. Our beautiful handmade baskets filled with thoughtfully selected items and finished with beautiful tulle wrapping make each basket an exceptional personalized gift. 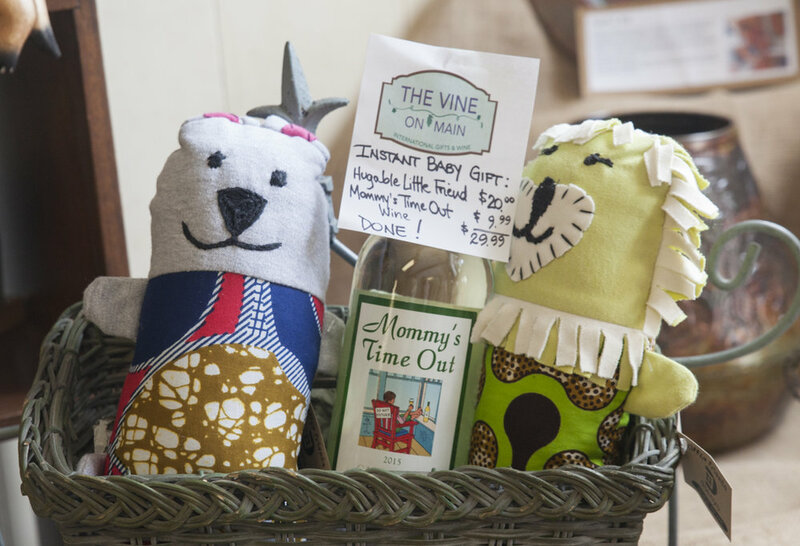 Bread-warmer baskets filled with wine for weddings and house-warmings, Zootie Booties with Mommy’s Time Out wine for baby showers and new moms, Spice of Life baskets for those who love to cook – the possibilities are endless and we love helping you put them together. You can be sure no one else will give them the same gift as yours, you can find everything you need all in one place, and we make them look special – no gift wrap needed.